Ken Burns doesn’t need an introduction, especially from me. Unlike most everyone who begins his speech this way, I will actually not provide one, but instead focus on his new film, The National Parks, America’s Best Idea, and my small part in it. The film is coming to PBS in exactly a month, between September 27 and October 2, two hours a night. I cannot recommend it highly enough. I first saw previews of the film in San Francisco in April this year. 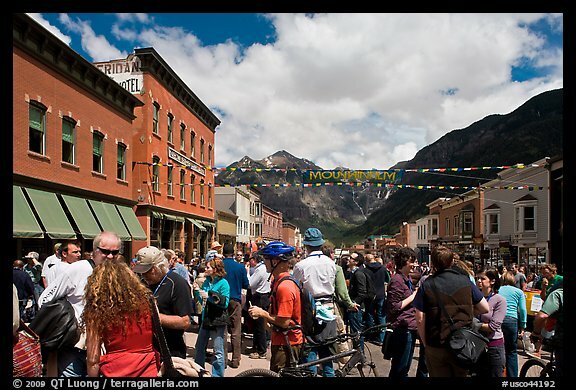 In May, I was invited to Mountainfilm in Telluride, where I exhibited a dozen of images and participated in a joint Q&A session with Ken Burns. I had the pleasure to share a suite with Shelton Johnson, a Yosemite NP ranger with such a great personality, voice, and insight that he appears in each of the six episodes of the film. During the festival, where the “The National Parks, America’s Best Idea” premiered, I saw the entire 12 hours of the film. The beautiful cinematography was a treat on the large screen, all the more enjoyable because I was able to recognize most locations. However, the focus of the film was not on the scenery, but on the human history. Like all the previous Ken Burns series, the film chronicles an important aspect of American history and invention. It is a story of democracy in action, through a uniquely American idea: that the most special places in the country should be preserved, not for some privileged people, but for everyone. I learned so much about the dramatic struggles and historical characters who made the National Parks possible. They ranged from icons such as John Muir, whose remarkable story is told in great detail, to a score of people whose name I hadn’t heard before, in spite of their importance to the National Parks. For instance, before George Melendez Wright undertook his studies, it was an official policy to feed garbage to the Yellowstone bears in front of tourists. Most unexpectedly, I was very moved, often to tears, by several episodes. It is a absolutely compelling story, marvelously told. 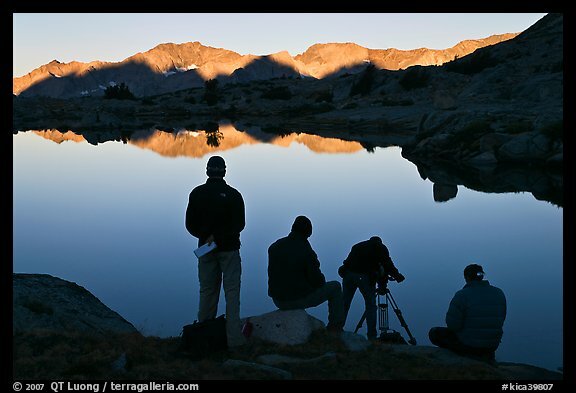 As photography had, from the start, played an important role in helping the parks get establish, many photographers are featured in the film, incidently all of them working in large format. William Henry Jackson’s photographs helped convince people back East that the wonders of Yellowstone were real. The Kolb Brothers pioneered photography in the Grand Canyon. George Masa, a Japanese immigrant, was instrumental in the founding of The Great Smoky Mountains National Park and the mapping and building of the Appalachian Trail. Ansel Adams took the images that convinced FD Roosevelt to approve Kings Canyon National Park – although FDR knew that he would never personally get to see those scenes himself. To this effect, Ansel sent a portfolio to the secretary of the interior, who showed it to FDR. However, FDR decided to keep the portfolio for himself. Ansel Adams was subsequently hired to photograph each of the National Parks. At that time, there were only about 25 of them, but he missed one. Almost last, Bradford Washburn, used large format aerial photography to map Denali and then pioneer a new climbing route to the summit. His appearance on camera was particularly moving, as he has since passed away. As the Parks themselves are characters in the film, Ken Burns and Dayton Duncan undertook an extensive location filming program, taking them to 53 of the 58 Parks. In the course of researching those locations, they found my National Parks gallery. At that time, I had already visited each of the 58 National Parks, and my website offered a wealth and quality of images of the Parks not available anywhere else, including on the National Park Service website. Many people have written to me to tell me how the images have helped them plan their visits. Much in the same way, the film crew used them to help plan their production. Subsequently, they became interested in using images to fill missing sequences in their cinematography, as well as to illustrate the companion book since they had only movie footage that does not print as well as still images. In the process of conversations, they became intrigued by the story of my life, which had been changed so much by my project. That would be a subject for another post, but in short it was my involvement with the parks that inspired me to make my home in America, and eventually quit a noted career in Artificial Intelligence to become a full time photographer. My project to photograph all the National Parks, despite the daunting task of lugging a 5×7 inch large format camera anywhere, had been accomplished in the most “democratic” fashion, self-financed, often alone, with no more support than any ordinary visitor to the parks in their own travels. Dayton Duncan invited me to join their crew on location, which I did twice. In Glacier Bay National Park, a boat was chartered. In Kings Canyon National Park, a pack of mules helped to transport the gear. It was interesting to see how a film crew worked, and to compare the different operating modes of a cinematographer and a photographer. They would look for views where panning adds interest by revealing features that were not visible at the beginning of the sequence. They would notice and try to capture even the most subtle motions, such as the shimmer of water on a Iake, or grasses swaying in the wind. There were similarities, too, besides getting up one our before sunrise. Their hefty tripod reminded me of my first Zone VI wooden tripod (a modified surveyor’s tripod). They even used a changing bag on location to load and unload film rolls. For those not familiar with large format photography, that’s a lightproofed bag with holes for your arms that you use as a “portable darkroom”. 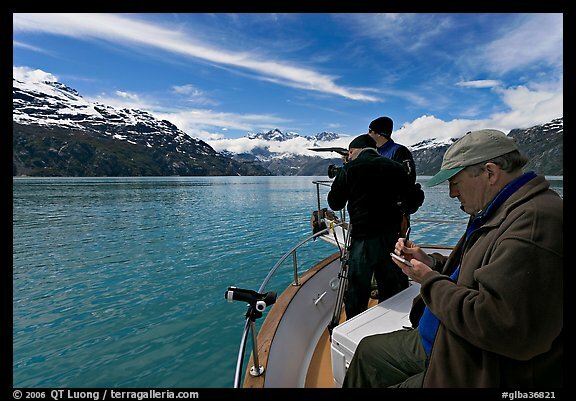 They filmed a sequence of me working on location in Glacier Bay National Park. Previously, Ken Burns had interviewed me in San Francisco for the film. Knowing all his achievements, I was initially quite intimidated on that occasion, so it was a surprise to see how young he looked, and how friendly he was. I felt very honored to be one of the few living characters featured in the film. From the beginning, I had sought to raise awareness and respect for those treasured lands, a goal I felt I shared with the makers of the film. Part of episode 4, you can see the short segment where I appear on the PBS site. When I saw the film segment in May, I was shocked to hear my thick French accent. I knew that sometimes people had difficulties to understand what I was saying, but that was the first time since becoming an adult that I saw myself on any footage! Update: Check this post for a more recent link to the clip. So very cool; many well deserved congrats on this. Talk about a great career highlight. Very well done, and looking fwd to seeing the film. Thank you for this write-up. We are going to a local PBS station breakfast with Ken Burns this morning and I am glad that I read this before going. Your words and descriptions will enhance that experience and make me even more eager to attend! Your photography is fantastic and I plan to look at your National Parks page more indepth later (can’t now — don’t want to get so immersed that I miss the opportunity to meet Mr. Burns in person). You sound like a special person in your own right. Thank you so much for sharing. Congratulations, QT. What an honor and achievement! Congratulations on being featured in a Ken Burns film! I’m a long time follower of your website and I knew that you would be richly rewarded for your National Parks project. Take care and thanks for this blog! What an honor to be part of this project. I can’t wait to see it. I have followed your amazing work for years and feature your site on a page sharing links to some of the world’s most talented outdoor photographers. 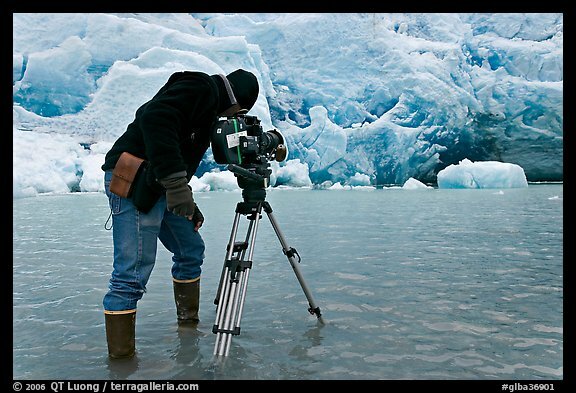 I have been to Glacier Bay many times, leading photo tours there, and will return in July 2010. I just saw your art in tonights episode and had to go find more. Thanks for sharing your spectacular work, it is inspiring. I too have followed your work for many years, and your large format website, and was thrilled to see you featured tonight on the Ken Burns episode 4. Your photographs are truly beautiful. I did not know of you until watching the National Parks on PBS tonight. Your work is truly amazing! Thank you for capturing all of God’s creation and sharing it to those of us who are not able to travel to see the world. I am glad to know that you are a Vietnamese and have achieved so much in a lifetime. Best wishes on your continued success! I have been following your site for at least 2 years now and I have loved and been inspired by your many images from all your travels and adventures. It seems to me you are living life in a way I can only dream of! And I am glad to hear you say you were brought to tears by this new film from Ken Burns. I have watched it every night and cried me eyes out with every episode and wondered if I was the only one doing so. It is a truly wonderful film and I am thrilled that you were part of it. If I can say so, then thank you for your photography of these majestic places we now have as National Parks and if you talk to Ken Burns again, tell him I said thank you for making that wonderful film! I learned of you by watching Ken Burn’s program and after quickly Googling your name, spent the last hour looking through your images from your travels to our National Parks and around the world. I am in total awe of your work and dream of getting to many of the places you’ve already been to and having the opportunity to capture the beauty, mood and feeling that your images produce. Congratulations to you on being featured in Ken Burn’s movie and sharing your work with all of us. As result of watching the up to date episodes of the PBS movie, I learned of you and your accomplishment. Curiosity pushed me to search and see if you had a website featuring some of your work (boy do you have a website…. 8?)). As a photog and former climber myself, I look forward to spending more than a few minutes gazing at your work, which looks like a feast for the eyes and the soul. Congrats on your achievements, photographic, academic and otherwise. Kudos to you! Your comment of being shocked by your own accent tickled me. To view our selves from outside the box of our own head is always interesting if not downright entertaining – but don’t try to change – it is just the warp and weft of who you are. Congrats on your small ( but to me intensely interesting ) part in the documentary. National Parks America’s Best Idea Blu-ray Disc DVD. Current store copies are 1080I format and are not to Blu-ray 1080P quality. Images are very noise loaded and greatly damages the filmakers images. I find out about you and your site through the Ken Burns doc. Following your segment/interview, they show some select samples of your work, the 4th image that they show is of a coastline, but I can’t find it anywhere on your site. It’s a haunting beautiful image, and I would love to see it in proper (non-film) resolution. Am I just missing it? Thanks, And keep up the exquisite work! Yes, with more than 6,000 images of the parks, locating an image can be difficult. the easiest way to find them is to enter those photo IDs in the search box in the top right on the main site. If you have the companion book, the photo credits for my images list those photo IDs. What a pleasure it was to meet you today at Yosemite National Park. My wife and I were introduced to you by Ranger Shelton Johnson and we want to thank you for taking the photo of us with Shelton. I will forward to you my pic of you and Ranger Johnson. Your website has blown me away with the diversity, originality and quality of your wonderful pictures. Continued success. Hello Sir: I just wanted to say how much I have long admired your marvelous photography and also to extend, long overdue, my heartiest congratulations to you for your fine involvement and obvious inspiration to all of the cre and produces for the PBS Documentary. As noted by one of the other commentattors here, I have long admired and bookmarked your terragalleria web page for many years now and I just love it. Not only is your work spectacular, but also are your amazing and wonderful contributions to nature, humanity, and the arts. So thank you, sir, from the bottom of my heart! You are truly an inspiration for everyone of us, especially who are nature lovers. I can’t wait to visit them myself.